To the right of Drug Dome is a wide, low-angle white slab with many ledges. This slab is directly below the approach ledge for Hobbit Book. 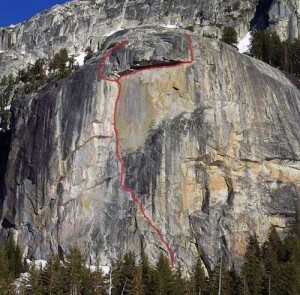 On the left side of the slab is an unusual route which, like Crystal Meth, can be used to approach Hobbit Book and other routes on the main Mariuolumne Dome. A fun romp up easy slabs, Euro Trash is easily the most contrived route in Tuolumne. It is an example of a style of climb somewhat common in Europe but rarely seen in the U.S. Consistently avoiding easier climbing by finding the hardest way up easy slabs, the contrived routefinding is highlighted by the crux – a 5.10c bulge through the steepest rock around, when climbing 40 feet to either side is 5.8 or so. Established on rappel by a French guide, the most surprising thing about Euro Trash is that it wasn’t chopped in the aggressive bolt wars that were occurring around the same time. Despite the contrived nature of the route, the first three pitches are very fun, well protected by many bolts, and only 5.8. The last pitch has very few bolts when compared to the first three pitches, but the crux has two right in a row, and with good pro supplementing the bolts, the pitch can be done at 5.8 A0. The first four bolts off the ground can be hiked around – literally – at 2nd/3rd class. The bolts are there mainly as route markers, sort of like cairns on trails. The last pitch traverses sharply right above the last bolt along a ramp, then finishes back left at a bolted anchor. It’s best to use long slings after the fifth (last) bolt. Careless parties on the approach to Hobbit Book can easily dislodge rocks in the section near the roping-up spot for the 4th class approach ledge, and any rocks dislodged in this area will rain down Euro Trash. Also, even careful parties on Stomper or Mordor may drop blocks that could fall here. Helmets are strongly recommended. Which SuperTopo guidebooks include a topo for Euro Trash?